Dozens of Egyptians held a protest on Thursday in front of the Egyptian Foreign Ministry in Cairo demanding the country to expel the Israeli ambassador from the country, and to sever all ties with Israel.The protestors said that Egypt must cut all of its ties with Israel due to the ongoing violations against the Arab and Muslim holy sites in Jerusalem, and the ongoing violations against the Palestinians in the Old City and the rest of Palestine. The protestors carried Palestinian flags and pictures of the Al Aqsa Mosque and occupied Jerusalem, and chanted slogans against the Israeli violations and the idleness of the Arab leaders. Members of the “Activists for Palestine” group, the organizer of the protest, demanded the Egyptian government to expel the Israeli ambassador, withdraw the Arab Peace Initiative, sever ties with Israel, halt the export of natural gas to Israel, and to end all forms of naturalization with the country. 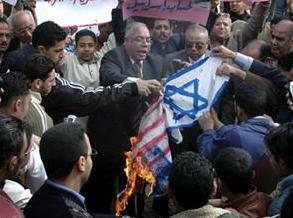 The protestors also torched Israeli and American flags to protest the American policies that support Israel’s occupation and the illegal Israeli activities.